President Roosevelt imagined an America of fearless optimism and global engagement at his Georgia hideaway. President Trump is challenging that worldview. But the place also shows how the times shaped both men. Photo courtesy of Patrik Jonsson of CSMonitor. 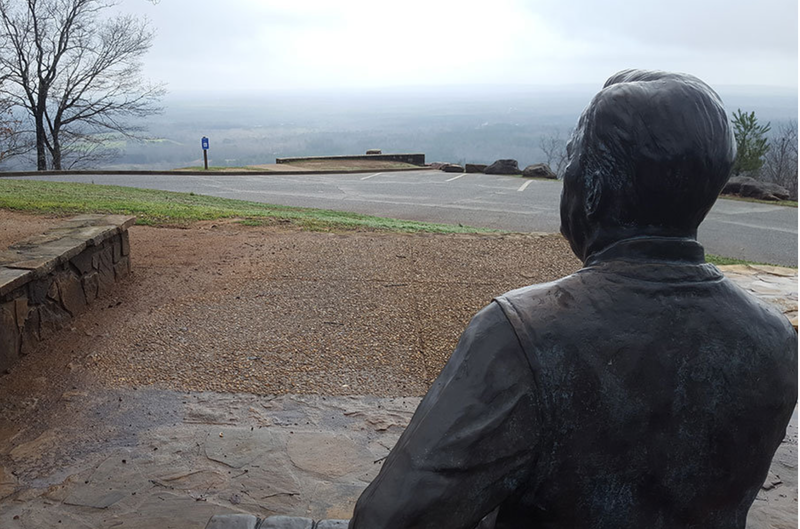 FEBRUARY 12, 2017 WARM SPRINGS, GA.—When President Franklin Delano Roosevelt gazed out from Dowdell’s Knob in April of 1945, he was greeted by a peaceful vista that contrasted, to its very horizon, with a bloodied and broken world. The four-term president’s favorite picnic spot on the crown of Pine Mountain, historians say, helped soothe the guilt of war and, in part, inspired the groundwork for what came afterward – a remarkable stretch of relative world peace, policed by the might, and guided by the vision, of the United States. Looking out on the same landscape this week, Jim Treadwell, a pseudonym for a local law enforcement officer who asked for anonymity to speak frankly, sees something darker: Danger sneaking through the hardwood groves below – whether Mexican gangs from nearby Columbus, Ga., or liberals moving to the Peach State countryside and making a fuss about protecting the wildlife. To him, that clear-eyed appreciation of danger – combined with liberal overreaction – sums up the young presidency of Donald Trump. Click over to CSMonitor for the full story (and the part with my interview)! Here is a link to the American Greatness article that partially prompted my interview!